Vauxhall has announced that the new VXR8 GTS model, based on Holden’s new GEN-F GTS, is available for order in the UK beginning from today. Fitted with a 6.2-litre V8 engine that drives the rear wheels producing 576bhp – a whopping 150bhp more than the outgoing model, the new Vauxhall VXR8 GTS will be an interesting alternative to more expensive cars like the BMW M5 or the Mercedes-Benz E63 AMG. The new supercharged LSA V8 (identical to that used in the Chevrolet Camaro ZL1) delivers 545 lb-ft (738 Nm) of torque, 140 lb-ft (190 Nm) more than the outgoing LS3-engined VXR8. 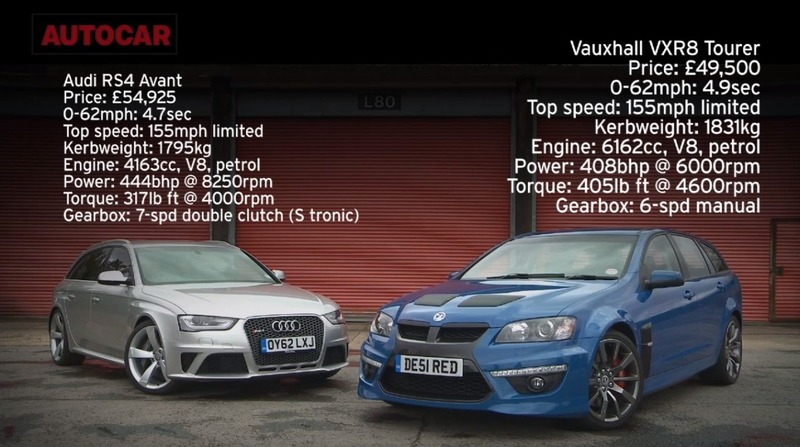 Although Vauxhall hasn’t released final acceleration figures, it hinted that the 0 to 60 mph (96 km/h) time will be well below the 4.9 seconds achieved by the naturally-aspirated VXR8, largely due to the Eaton supercharger. Featuring 4-lobe rotors, 9 psi boost and 1.9 litres of air per revolution, the supercharger is said to provide the VXR8 with stronger and more linear performance across its entire rev-range. The engine is mated to an MG9 spec 6-speed manual gearbox with oil cooler and twin-plate clutch, but there’s also an optional 6-speed automatic transmission available. As far as the design is concerned, there are no surprises: the Vauxhall VXR8 GTS is simply a rebadged Holden GEN-F GTS. The new VXR8 GTS starts at £54,999 in the UK, with the first deliveries scheduled for the end of this year. That will be a monster! I still miss mine although I don't miss dealing with Vauxhall in any way, shape or form! Serious power for the money and I like the styling updates too. I see the present version of this every morning, or I should say I HEAR it first. Looks great, sounds amazing. You can pick up a 6 month old M5 for that, easily. Or a brand new M3 (for considerably less on the run out models anyway as dealers are giving those away). It looks like it has driven through a parts bin with superglue on it. Would be a good secondhand buy. The saloon in black looks a lot better. It's the noise it makes that grabs your attention. I'm waiting till the VXR8 is even more of a bargain, my type of car that, all noise! What else can you get for the price? (new!) that makes that sound, goes well and looks pretty decent to boot!!? The new ad' for the F type is bloody clever. And it looks beautiful. Well done Jag. But depreciation isn't exclusive to the M range. The VXR will drop like Newcastle United after 3 months.